Earlier today the WBO released their latest world rankings. At Minimumweight it really is all change at the top. We've seen Pigmy Kokietgym (previously #1) fall out of the rankings due to his loss to the previously unranked Jaysever Abcede (now ranked #7), we've also seen Ryuji Hara (previously #2) removed ahead of his IBF title fight with Katsunari Takayama later this month. As a result of that shake up Carlos Buitrago (#1) has been moved to the top contender status and may well have an opportunity to face Kosei Tanaka in a mandatory title fight later this year. Other changes in the division including a move up the rankings for Vic Saludar (#4) who claimed following his recent victory, which saw him claim the Asia Pacific title. At Light Flyweight we've seen Palangpol CP Freshmart (#12) fall one place whilst his countryman Petchchorhae Kokietgym (previously #12) fall out of the rankings following his loss to Iwan Zoda. Sadly Zoda hasn't been rewarded for his excellent win. Notably though Zoda is mentioned at Flyweight where he seems to be the “next in line” outside of the top 15. Talking about the Flyweight division we've again seen some changes. The key to these changes is the fact Hernan Marquez (#3) has suddenly appeared having previously been ranked at Super Flyweight. Maruqez's appearance has seen everyone below drop a place, including Suguru Muranaka (#4), Zou Shiming (#7), Kwanpichit OneSongchaigym (#8), Nawaphon Por Chokchai (#9) and Koki Eto (#10). Super Flyweight, where Hernan Marquez was previously ranked, has seen a number of changes including a slight move up for Rex Tso (#3) and Petchbarngborn Kokietgym (#6). Lower down the rankings Takuma Inoue (#10) has moved up a couple of places whilst Srisaket Sor Rungvisai (#12) has supplanted himself into the rankings. 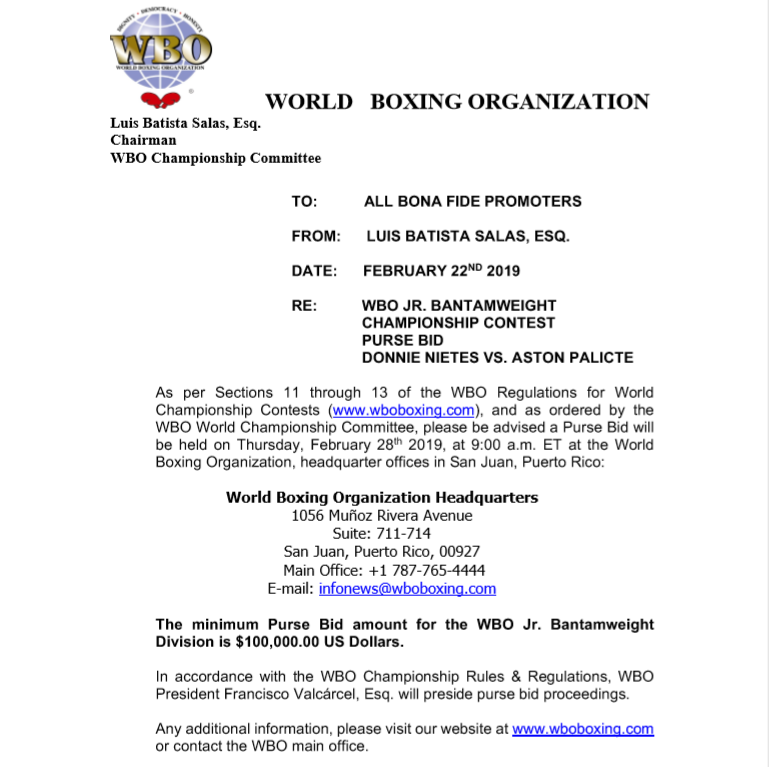 Strangely the WBO seem to have ranked WBA “interim” champion David Sanchez (#11) who is, we believe, the only current interim champion with a WBO ranking. At Bantamweight we have seen some very few changes with Ryo Matsumoto (#4) climbing 5 places following his recent win over Luis May, in what is effectively the only change of note. There are very few changes at Super Bantamweight where Nonito Donaire (#2) has swapped with countryman Genesis Servania (#3), further rubbing salt into what has been a frustrating year for Servania. At Featherweight we've seen a few small changes with Chonlatarn Piriyapinyo (#4), Satoshi Hosono (#6) and Hiroshige Osawa (#11) all moving up a place whilst Tsuyoshi Tameda (#12) has gate crashed the rankings following his recent win over Mark Bernaldez. Interestingly Chonlatarn has announced that he is leaving the 126lb division so we could see another reshuffle very shortly. At Super Featherweight we've seen no changes in regards to Asian fighters, the same also applies at Lightweight. At Light Welterweight both Adones Cabalquinto (#11) and Keita Obara (#12) have moved up a place. Despite their rankings neither is likely to get a title shot any time soon and possibly the best thing they could do is face each other in the hope of a lofty ranking boost. There is no change at Welterweight. At Light Middleweight we've seen Yuki Nonaka (#12) slip a couple of places down the rankings. In the Middleweight rankings Ryota Murata (#5) has climbed a single place. In the Super Middleweight division we've lost Yuzo Kiyota (previously #14). There are no Asian ranked fighters in the 3 highest divisions, though the WBO do list Heavyweight Edmund Gerber (#9) as a Kazakh fighter, regardless he remains where he was a month ago. Earlier this week the WBO released their latest rankings and we've got to be honest there was a lot of changes in here. The first change has seen Filipino prospect Vic Saludar (#7) move up a place whilst compatriot Jeffrey Galero (#8) has mysteriously appeared in the top 10. Below those two is Japan's Go Odaira (#9) who has seemingly climbed 3 though his move isn't as mysterious as that of Ryuya Yamanaka (#10) who has seemingly come out of nowhere to get a ranking. Lower down Jessie Espinas (#13) has climbed a place whilst Reiya Konishi (#14) enters the rankings. At Light Flyweight we've seen Akira Yaegashi (#3) drop a place, though questions have to be asked as to why he is ranked at 108lbs, other to drop a place in the top 10 are Jonathan Taconing (#6) and Yu Kimura (#7). A little lower down Palangpol CP Freshmart (#11) has also dropped a place whilst fellow Thai Petchchorhae Kokietgym (#12) has climbed a place, at the expense of Milan Melindo (previously #11) who has been removed from the rankings. At the bottom we've seen Raymond Tabugon (#15) claim a ranking. The Super Flyweight division, thankfully, hasn't had such a big shake up. It's first change has seen Petchbarngborn Kokietgym (#8) climb a single place, we have a new entrant a little bit down the rankings with Ricardo Rodriguez (#11) above Takuma Inoue (#12), who remains where he was. A little lower we've seen Jerwin Ancajas (#13) and Sho Ishida (#14) each climb a place whilst we've also welcomed a new entrant, Jetro Pabustan (#15). It seems that Srisaket Sor Rungvisai (previously #13) has lost his ranking due to being the WBC mandatory and it's allowed Ancajas and Ishida to move up, as well as creating space for Pabustan. The Bantamweight division saw a new champion being crowned with Pungluang Sor Singyu (previously #2) beating Ryo Akaho (previously #1, now unranked). That bout has given the rankings a shake up. Now the top contender is Filipino Marlon Tapales (#1), who has understandably climbed a couple of places. Behind Tapales is Zhanat Zhakiyanov (#2), who has climbed 3 place, and Shohei Omori (#3) who has jumped up 9 places! Ryo Matsumoto (#9) has climbed a single place to keep him ahead of Yushi Tanaka (#10), who moved up 4 places, and both of those are just above OPBF champion Takahiro Yamamoto (#11). Lower down the rankings are Suriyan Sor Rungvisai (#12) and fellow Filipino Ernesto Saulong (#13), who appear to both be new entrants. At Super Bantamweight we've seen former #1 contender Genesis Servania (#2) fall a single place whilst stablemate Albert Pagara (#6) has really gate crashed the rankings as a new entrant. Another new entry from the Philippines is Bernabe Concepcion (#10), who has pushed fellow Filipino Juan Miguel Elorde (#11) down a place. Another man falling a place is Shigno Wake (#15), who has got his eyes on an IBF title fight. Things are a bit simpler at Featherweight where Chonlatarn Piriyapinyo (#5) has climbed 3 places and Hiroshige Osawa (#12) has climbed 2 places. There have been no changes for us to note at Super Featherweight, Lightweight, Light Welterweight or Welterweight. At Light Middleweight we've seen Japan's Yuki Nonaka (#10) climb a couple of places whilst China's Yao Yi Ma (#14) has climbed into the rankings. At Middleweight we've seen Japanese star Ryota Murata (#6) climb 3 place. We've had no change at Super Middleweight. There are no Asian fighters ranked at Light Heavyweight or Cruiserweight. Strangely the WBO list Heavyweight Edmund Gerber (#9) as a Kazakh, though he is widely viewed as a German fighter, despite being born in Kazakhstan. The bigger issue however is the explanation as to how on earth he is ranked in the top 15. Notably he has climbed 5 places. At Minimumweight it's all change as we've seen Kosei Tanaka (previously #2) claim the previously vacant title with his excellent win over Julian Yedras (who has dropped from #1 to #10). The changes at the top have left Pigmy Kokietgym (#1) as the top ranked contender ahead of former Tanaka for Ryuji Hara (#2) with another Japanese youngster, Takumi Sakae (#4), all sitting on a verge of a world title fight. All 3 of these men have climbed significantly up the rankings helped by the recent title fight. Lower down the ranking's we've spotted the new inclusion of recent WBC title challenger Jeffrey Galero (#9) whilst another new entrant is former IBF title challenger Shin Ono (#15). At Light Flyweight we've seen some small changes, with the most notable being the drop down the rankings of recent IBF title challenger Milan Melindo (#11) who has dropped 5 places and allowed a climb for bother Jonathan Taconing (#6) and Yu Kimura (#7). Lower down the rankings we've lost Nawaphon Por Chokchai (previously #10) who has been moved up to Flyweight. Lower down the rankings we've seen Petchchorhae Kokietgym (#12) climb a couple of places and over-take countryman Palangpol CP Freshmart (#14). At Flyweight we've seen some questionable rankings with Kwanpichit OnesongchaiGym (#7) climbing a place at the expense of China's Zou Shiming (#10), who drops 3 places, that's despite Shiming's clear win over the Thai only a few fights back. Another climber is Koki Eto (#8) who has climbed 3 places whilst new entrant Nawaphon Por Chokchai (#9) is ranked at his more natural division. Lower down the rankings we've seen both Yodmongkol Vor Saengthep (#10) and Ryo Miyazaki (#11) drop slightly whilst Ardin Diale (#13) is a new entrant. There haven't been many changes at Super Flyweight, however Sho Ishida (#12) has dropped a place. There are a number of changes in the Bantamweight rankings, the first of which is a boost for Marlon Tapales (#3), who has climbed a place. The big “dropper” for the month was Filipino veteran Malcolm Tunacao (#13) who has fallen 7 places. As for climbers we've seen Ryo Matsumoto (#10) climb a couple of places whilst Shohei Omori (#11) has climbed 4 places. We've also a new entrant as Yushi Tanaka (#14) replaces Alie Laurel (previously #14). The Super Bantamweight rankings haven't seen many changes though we have seen Ryosuke Iwasa (#11) drop 4 places following his loss to Lee Haskins in an IBF Bantamweight title bout. Iwasa's fall has allowed Juan Miguel Elorde (#10) to climb a place. At Featherweight the only change concerns Chonlatarn Piriyapinyo (#7) who has climbed a single place. At Super Featherweight we have seen Juan Martin Elorde (#7) climb a single place whilst Terdsak Kokietgym (#5) has suddenly appeared in the rankings. Things have been shaken up a bit at Lightweight. Firstly we've seen Daud Yordan (#5) shoot an impressive 7 places up the rankings after recently winning the WBO Africa title, and no we're not making that up. We've also seen the re-ranking of Takahiro Ao (#8), after Raymundo Beltran failed a drug test in the wake of his win over Ao. The rankings at Light Welterweight have been given a notable shake up. Among the winners of that shake up are Jason Pagara (#2), who has climbed 3 places, whilst Adones Cabalquinto (#12) has climbed two spaces and a place has been made available for OPBF champion Keita Obara (#13). Azerbaijan's Welterweight hopeful Fariz Mammadov (#13) has dropped a place in the only change at 147lbs. The Light Middleweight rankings haven't seen any changes. In the Middleweight rankings we've seen only a single change as Ryota Murata (#10) has climbed a place and is slowly working his way towards a world title fight. The Super Middleweight rankings haven't seen any changes. There are no Asian's ranked any higher than 168lbs. Recently the WBO posted their updated world rankings for May. There have been no changes at all in the Minimumweight division. At Light Flyweight we've seen Fahlan Sakkreerin Jr (previously #3) lose his place following an unsuccessful challenge against IBF Minimumweight champion Katsunari Takayama. Strangely we've seen Akira Yaegashi (#3) take a huge boost up the ratings by climbing 6 places, despite making it seem clear that he has no intention of fighting at 108lbs again. Even more strange is the fact that both Milan Melindo (#6) and Jonathan Taconing (#7) have each dropped a place. The talented Yu Kimura (#9) has climbed a place as has the unbeaten Nawaphon Por Chokchai (#11). The bigger at Flyweight this month has been Froilan Saludar (#3) who has climbed 5 places following his recent win over Faris Nenggo. As a knock on effect from Saludar's climb we've seen Kwanpichit Onesongchaigym (#8) move up a place and space has been made for Yodmongkol Vor Saengthep (#9) to climb into the ratings. Another new entry is Macrea Gandionco (#14) who is ranked following his win over Xiang Jing (previously #14). At Super Flyweight we've seen Japanese champion Sho Ishida (#11) drop a couple of places after his recent title defense against Taiki Eto. We've also seen talented Filipino Jerwin Ancajas (#13) drop a place whilst Oleydong Sithsamerchai (previously #13) has slipped out of the top 15. There haven't been any changes at Bantamweight, which looks strange given that Alie Laurel (#13) was beaten by Ernesto Saulong a little while back. We'll put this down to an over-sight however. At Super Bantamweight we've seen a few perplexing changes. Firstly we've seen Nonito Donaire (#5) fall a place, due to former KO victim Fernando Montiel being randomly given a #4 ranking. We've also seen Ryosuke Iwasa (#7) fall a couple of places in a division that he still shouldn't be ranked in. Lower down we've seen Hisashi Amagasa (#13) drop a place. The Featherweight division has seen a small shake up which has helped Satoshi Hosono (#6) and Chonlatarn Piriyapinyo (#8) both climb a place whilst Hiroshige Osawa (#13) has been boosted a couple of places up the rankings. There is also a small boost at Super Featherweight with Juan Martin Elorde (#8) climbing a single place. In the Lightweight division we've lost Takahiro Ao (previously #1) following his defeat to Raymundo Beltran. As a knock on of Ao's loss we've seen both Daud Cino Yordan (#12) and Yoshitaka Kato (#13) each receive a boost of a single place. More single place climbs at Light Welterweight as Jason Pagara (#5) and Adones Cabalquinto (#14) have both taken a small step up the proverbial ladder. Yet another single place climber is found at Welterweight as Fariz Mammadov (#11) has been moved up slightly. At Light Middleweight Sirimongkol Singwancha (#8) has moved up a place. A big move at Middleweight has seen Ryota Murata (#11) enter the rankings courtesy of his recent victory over Douglas Damiao Ataide, who had previously been ranked #15. There have been no changes involving an Asian at Super Middleweight, with Yuzo Kiyota (#14) holding on to his ranking. Unfortunately no Asian fighters are currently ranked by the WBO above Super Middleweight. (Image courtesy of the WBO).